The bunting was out in June for this year’s Street Party in Wardley Street. Every summer the respite team in Wandsworth get together with the local community to close the road and throw this fundraising bash for families, friends, carers and people who use the service. The event has become a firm fixture on the local calendar and this year the celebrations were bigger and better than ever. 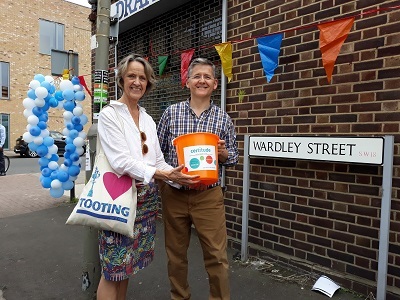 The Friends of Wardley Street plan the party, with staff, months in advance and this year added a live band as well as a DJ to create a lively atmosphere and attract the crowds. Everyone connected with service got involved; setting up gazebos, making cakes, sourcing raffle and tombola prizes, working on stalls or donating jewellery, plants and bric-a-brac to sell. “I was delighted to see so many people enjoying themselves this year – including people we currently support, people we have supported in the past, families, carers and members of the public. It’s a great opportunity for everyone to make new connections, meet new people and demonstrate that people we support have an active presence in their local community and are able to make a valuable contribution to it. Local councillor Angela Graham popped along to join in the party and help with the fundraising. In total the event raised over £600 which will be used by The Friends of Wardley Street to make a respite stay at the house even more enjoyable for guests.